Following peace efforts by the governments of Afghanistan and US, the US senate asked President Trump to prioritize Afghan women in peace talks with the Taliban. In a letter sent to US department of state, US senators wrote that their soldiers have been sacrificed to protect Afghan women rights. They stressed that with involving women and turning their rights into a main part of peace talks, the US president should not allow their investments to go in vain. The concerns raised while women rights defending entities expressed their concern on women role and presence in peace talks and asked the warring-sides not to ignore women in these negotiations. Afghan women network’s press chairwoman Humaira Saqib said this was a clear fact that without presence of Afghan women, no process, particularly peace process would get succeed. This comes as the Afghan government says that it has always consulted with different segments of the society in term of peace and it wouldn’t ignore civil society and women role in this regard. There were a number of women among the negotiating delegation members as well as their presence is felt in high consultative board of peace, government officials said. This is not the first time that women rights’ activists have expressed concern on women presence in peace process and asked to be further involved in this process. Afghan women and civil society have stressed that to guarantee the achievements made in over one and half a decade in the peace process is only possible through them. Peace is a valuable opportunity to Afghan women, a private university lecturer Fariha said. To change generation situation of women, they should have presence in big political decisions, she added. Afghan women have faced much problems in the course of history and they have been deprived to access many opportunities and facilities during different eras and unfortunately, this process is still ongoing in remote areas of the country, according to her. In fact, Afghans could fight with ongoing challenges and relevantly achieve their rights through education, political, social, cultural and economical activities. 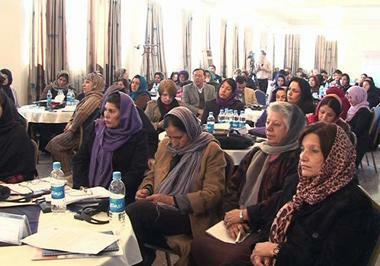 Therefore, protection of achievements, is one of the serious concerns of women in peace process. Thus, the government is obliged to support women particularly in peace talks and elections.